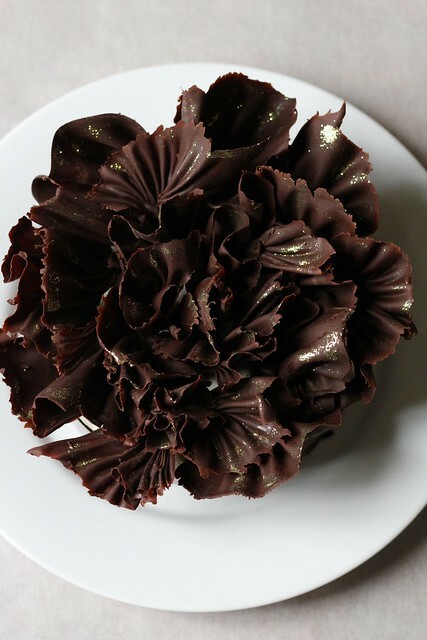 I know that I’m a week off with this one, but it took some extra time for me to get motivated to make Alice Medrich’s Chocolate Ruffle Cake from Baking with Julia. 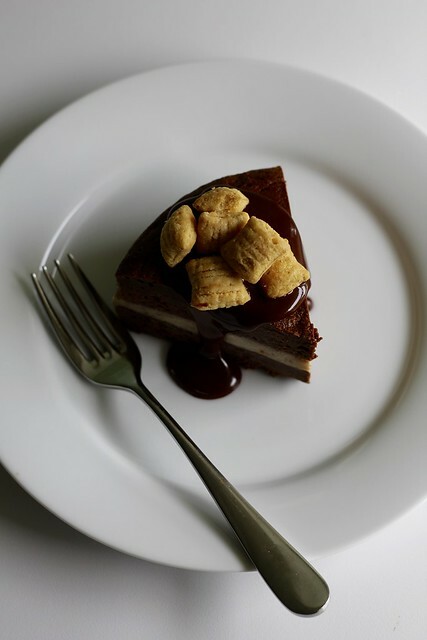 Maybe I’ll get to that Hot Chocolate Panna Cotta from Baking Chez Moi for a rewind week. 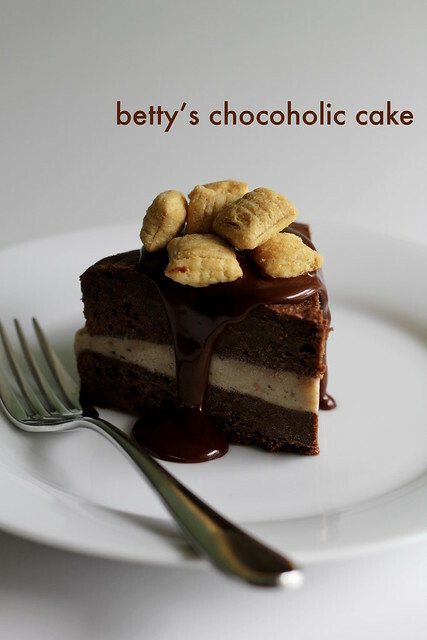 I had my hands full with this one, what with making a genoise, a cake filling and all kinds of chocolate deco work. 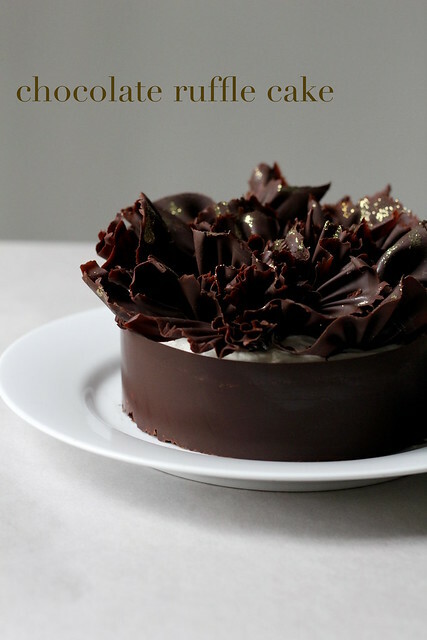 It is impressive, though, with its beautiful ruffly top and sharp chocolate band. This cake could easily be spread out as a weekend project, although once I did get off my duff, I just charged through it. 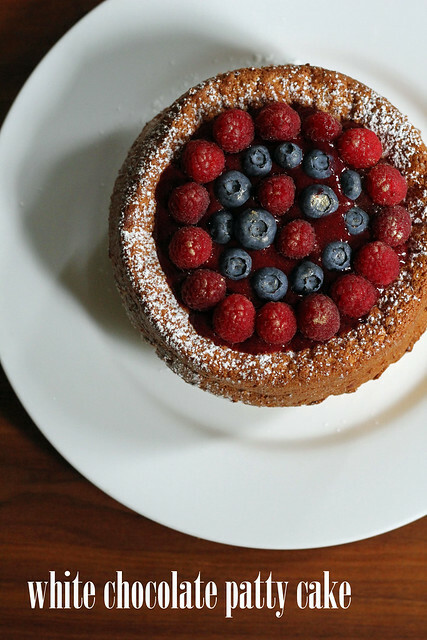 I was only making this cake for the two of us so I downsized the recipe by half to fit into a 6-inch pan. Since the cake was smaller, I figured I could get away with slicing it into just two layers instead of three. 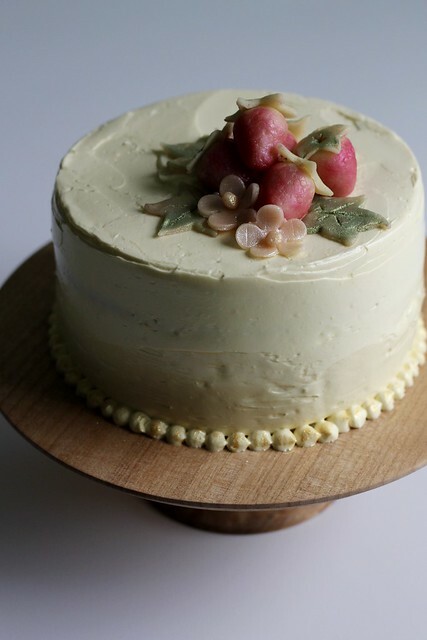 I like when one bit of simplification leads to another, and with only two layers to sandwich, I skipped the chocolate cream filling layer in favor of just plain cream. 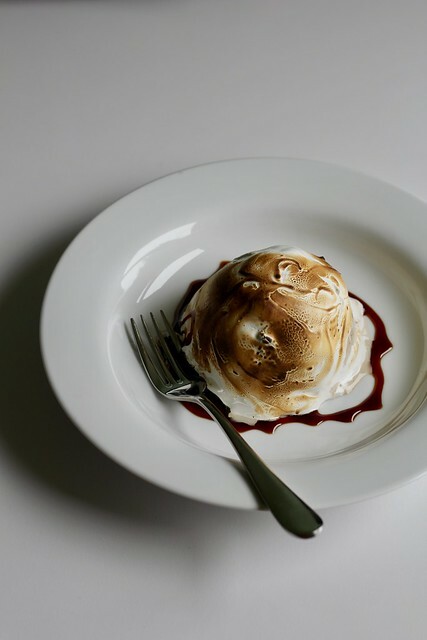 Oh, and instead of using whipped creme fraiche as my filling and topping, I used whipped cream stabilized with a nice blob of mascarpone (so tasty!). I only did this because wanted it to hold up for a few days…even a 6-inch cake takes us a while to eat up. Also rather than fresh (winter) raspberries in the filling, I used some booze-preserved cherries that I jarred over the summer, and the cherry booze liquid became my soaking syrup for the cake. Sounds like I made a lot of changes, but really, they were pretty minor tweaks. Dorie says in to recipe intro that we can think of this cake as a variable format rather than a precise formula, so I felt free to do so. Anyway, it’s delicious– I basically turned it into a Black Forest cake. 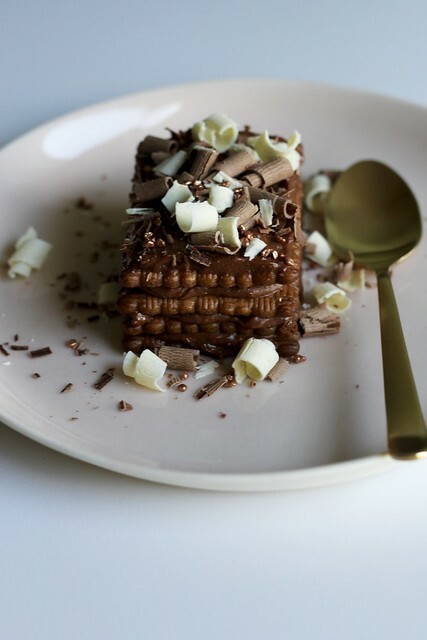 The chocolate work can seem intimidating, and I can hardly describe the process myself, so if the book’s instructions aren’t clear, these videos of the TV episode are really helpful. No tempering is involved, so it’s really not that bad, even if it does take a few practice swipes get get nice ruffles. 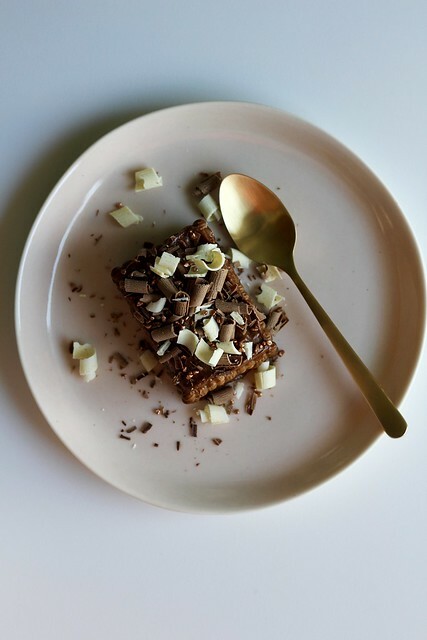 Mine weren’t perfect– and I’m the “chocolatier” (it is embarrassing for me to say that!) at the restaurant I work for– but they were good enough to make a lovely, swirly-twirly arrangement on top of the cake. 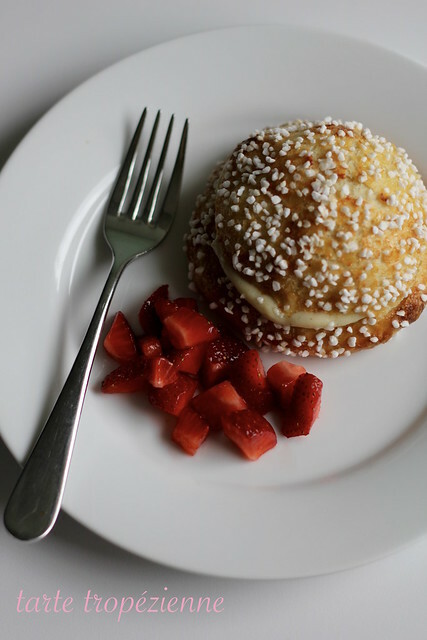 If you’re up for a weekend challenge, see Baking with Julia by Dorie Greenspan for the recipe. There are also a couple of videos of Alice and Julia making the cake together. Don’t forget to check out the rest of this week’s TWD Blogroll! Happy New Year, friends! I want to start 2016 fresh, so it’s time for me to take care of a few pesky things that I’ve left in limbo over the last couple of months. One is Flo Braker’s Raspberry Swirls recipe, which I actually made along with the group in the fall and then never posted. 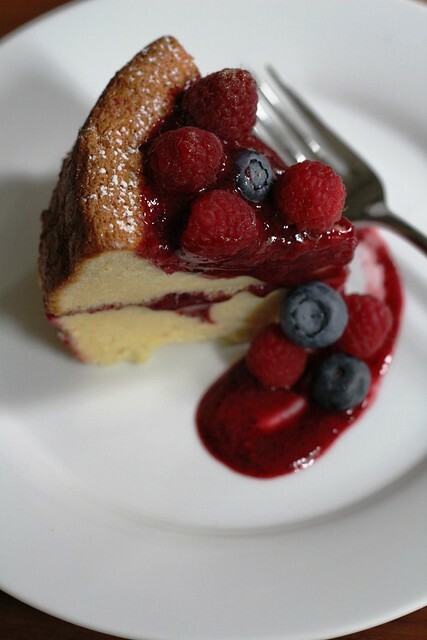 This uses a sheet of genoise that’s been cut and coated with raspberry jam and then rolled up jelly-roll style, the jam forming a little red curlicue in the middle. Like Braker’s Miniature Florentine Squares or Glazed Mini-Rounds her Raspberry Swirls are meant to be cut into one or two bite petits fours, but after I rolled them, I decided to leave them more the size of HoHos (or Yodels or Swiss Rolls, depending on your childhood treat preference). 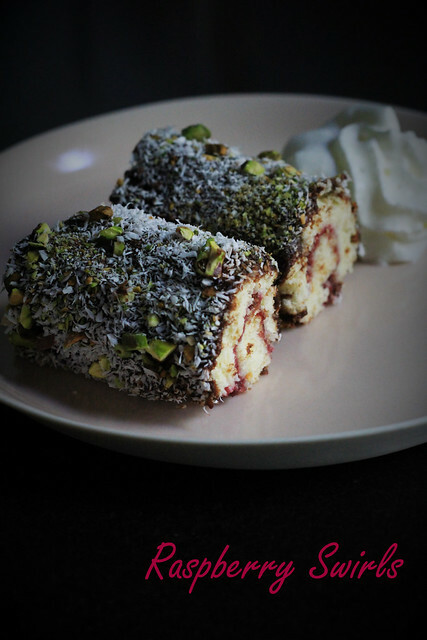 Indeed, these were good…once I glazed them in chocolate and dipped them in coconut and pistachios, they actually reminded me of a rolled up Lamington, an idea I would like to explore further (possibly for Australia Day??). 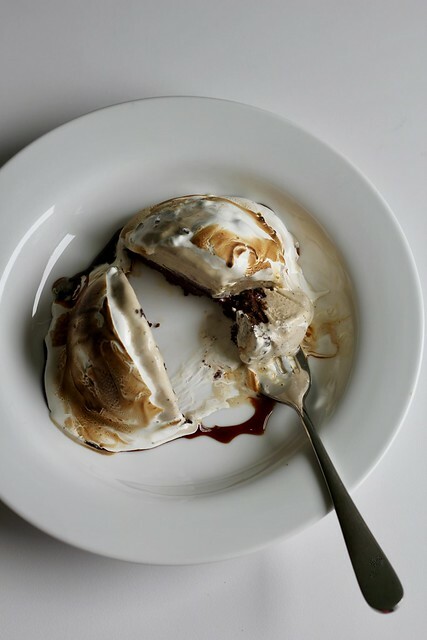 For the recipe, see Baking with Julia by Dorie Greenspan. Don’t forget to check out the rest of the TWD Blogroll to see if anyone else did a rewind this week, and see the links page from the Raspberry Swirls week a few months ago! I make a lot of petits fours at work, but it’s not often that you’ll see something like Flo Braker’s Miniature Florentine Squares or Glazed Mini-Rounds making an appearance at my house. I don’t usually get that old-fashioned fancy here. If I serve up anything post-dessert, it’s typically just a healthy-sized complaint about having to do all the dishes myself. 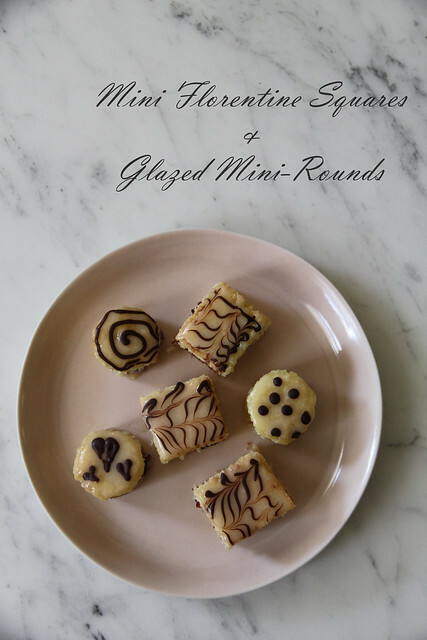 The Florentine Squares and the Glazed Mini-Rounds are two different recipes in the book, but they are both made the very same way, just cut and decorated a little differently. 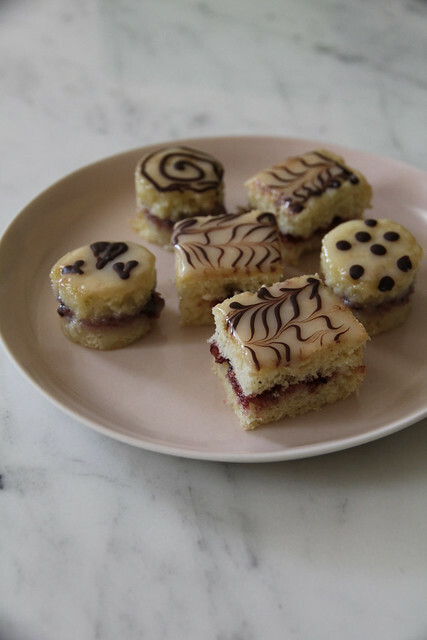 They are both ladyfinger genoise layers soaked in sweet wine syrup, sandwiched with jam (I used blackcurrant), glazed with white chocolate ganache and decorated with designs of melted dark chocolate. 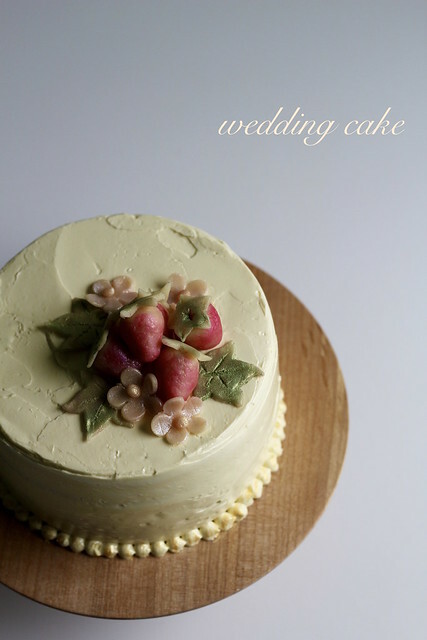 I made one cake and cut and decorated some of each style. They weren’t so hard to make (I watched the video first, and got some tips on chilling the cake before cutting to prevent too much crumbage) and they were pretty fun to decorate. It’s so hot in my kitchen that my dark chocolate designs got a little droopy as the petits fours sat for their photo shoot. I thought they were still charming though. These were tasty little bite-sized treats, but they were quite sweet. They would have been good with a strong cup of coffee. 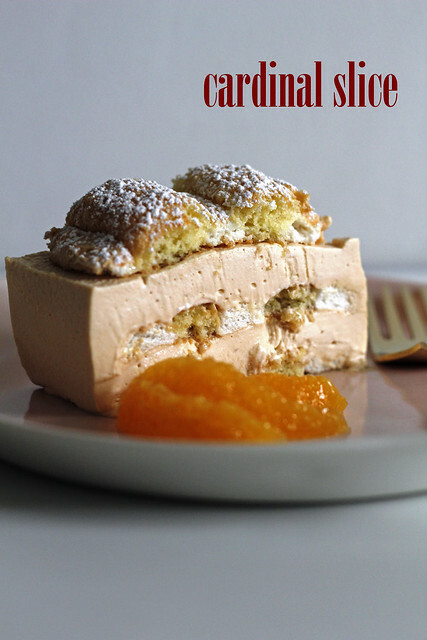 For the recipe, see Baking with Julia by Dorie Greenspan (and here’s a video). Don’t forget to check out the rest of the TWD Blogroll!